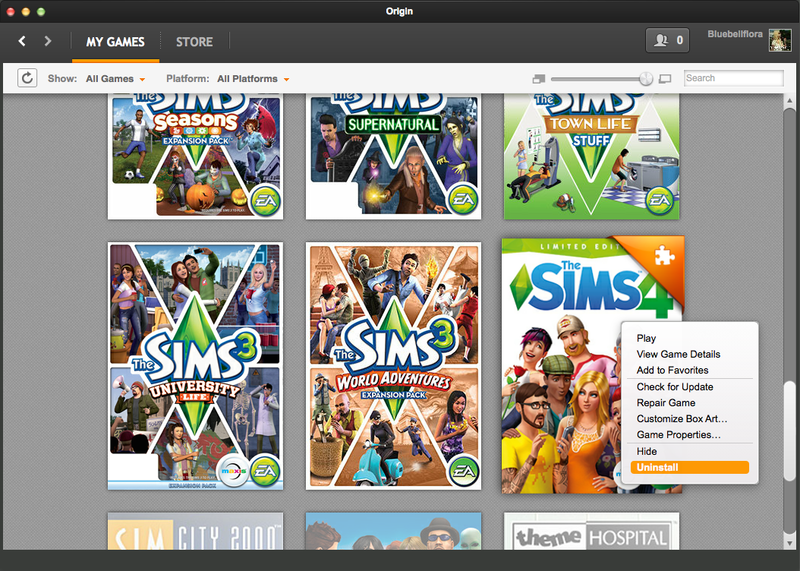 Uninstalling The Sims 4 on a Mac is really easy because of Origin. This will get rid of all your user data too so if you want to keep your saves and settings for a future install make sure you drag your user data folder onto your desktop before uninstalling. You can find the folder by navigating to Documents > Electronic Arts > The Sims 4. If you’re having problems with the game and Origin then you may need to completely uninstall Origin too. This is a bit more complicated as you have to search for the files to delete manually. You can find full instructions on cleanly uninstalling Origin here. If your game isn’t behaving properly it’s always worth trying to repair the game before uninstalling it. You can select Repair Game instead of Uninstall from the drop down menu when you right click on the game. 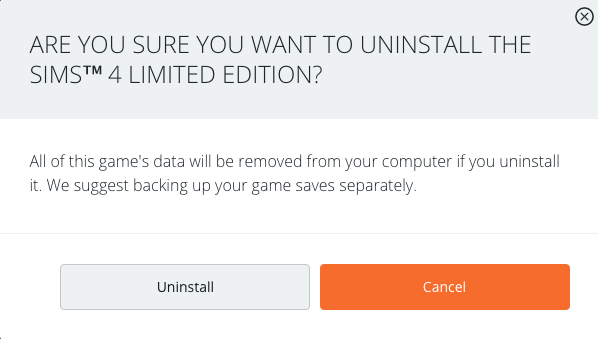 And finally, if your game is not even uninstalling properly, your best bet is to uninstall Origin and start again. But how to uninstall the sims 4 so you can download it on another origin account? I don’t understand what you’re asking. You want to play the game under a different Origin ID? Have you purchased the game twice? Sorry BluebellFlora, I gonna explain: I have a account but I can’t use the gallery, so I want to make a new account so I can use the gallery. Or do you know how to use the gallery? By my it called the library and you can’t see what other sims had create. Do you know something for that issue? You have to be logged in to use the gallery. If you make a new Origin account you’ll have to buy the game again. I think. If I unistall my sims 4 game will Origin delete it? Or will it still be there under ‘my games’ and be there until I decide to re download it again? It will always be there because it is associated with your account. So long as you log in with the same account details when you want to download it again. Thank you so much for making it easier for someone who is not very computer savvy to understand. I always look for your posts when I have issues. If i uninstall my game will i be able to install it again? Is there a way to manually uninstall the Sims 4 from a mac? I tried to delete it ages ago but I don’t think I did it correctly. I just deleted the program and obvious associate files. Now my computer is alway full and I have a feeling that’s why. Did you delete the Sims 4 folder from Documents > Electronic Arts? It won’t be taking up a huge amount of space though so maybe it’s other stuff on your Mac which is taking up space. Click on the Apple icon then About this Mac then Storage (depending on which version of OS X you are using), you will be able to see what’s taking up space. Do you have secondary click enabled in System Preferences for your mouse/trackpad? What is listed in the options in Origin? Is it possible to uninstall just an extension pack from the game? No, unfortunately not.You can try deleting the folders but it is at your own risk and they may reinstall automatically though Origin anyway if you have automatic updates turned on. 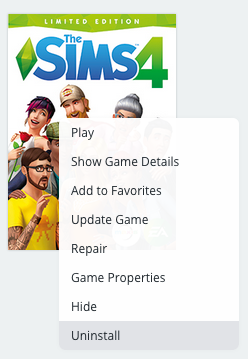 To try it – Right click on the Sims 4 in your Applications folder then Show Package Contents. In the Contents folder delete the EP/SP/GP folder of the pack you want to uninstall. Once you’ve done that go into the Delta folder and delete the same EP/SP/GP. I have uninstalled both Orgin and Sims4 because I was not able to upgrade Sims4. A sign saying a fault appeared -4:0 every time I tried. I have now installed Orgin again and trying to install Sims4. But the same sign is coming up with the fault -4:0 telling me to try later. Do you know what I can do? What Mac do you have and how fast is your internet? Hello, if I uninstall the game from origin, will I be able to install it again on another origin account?? No, the game is tied to the account it is registered to. You cannot uninstall the game from your Origin account, only the computer. Hi! I have the sims 4 on my old mac and i just bought a pc. If I uninstall it on my mac and download origins on my pc, can I install it again? Hello, hoping you may have some insight as your posts are always so helpful! I am trying to Uninstall Sims 4 from my Mac. Every time I pressed control+uninstall, nothing would happen. I tried updating, repairing, and restarting multiple times. Finally, after pressing Uninstall a prompt came up for my comp password to continue. However, nothing else happened (not sure exactly what would appear?) except now the “Uninstall” button was no longer there. I was able to click “Play” still from my library but an error would appear. Now, there is no play option but game is still in my library as well as the icon on my desktop/have an EA folder still. I dont know if that would be the case if it was truly uninstalled, just sort of confused from this all around. You don’t click on CTRL when you select Uninstall. You hold down CTRL if you don’t have secondary click enabled on your Mac mouse/trackpad to bring up the menu. You then just click on Uninstall. The game will always be in your Origin games library because it is tied to your Origin account. Is it showing in your Applications folder? If you click no the game in your origin games library what orange button is it showing – Play or Download/Install? Hello i am new to this forum and would like to know if anyone else is having problems launcing the sims 4 game recently. i have contacted EA and keep getting the run around about them having a tech issue with mac consoles. Its been a week now and still not able to play and my account says my game library is empty.frustrated. can you respond soon, as i need it repaired but that wont work as well. Hello, I have this installed on 2 devices. If i ask to uninstall will it only affecting the mac I am on now or will it also uninstall it from the PC is it also on?